From Coach Jerry: Mark has been a great addition to NOVA. All I can ever ask of an athlete is to work hard and do his best, and Mark has done just that for the last two years. Mark isn’t the most talented athlete on the team, but he takes the sport very seriously, and his consistent improvement is a testament to his hard work. Mark has a lot more improvement coming, and I’m excited to see his continued progress. With 2018 winding down, I only have a couple of races left as of this writing. Alexandria Turkey Trot 5 Miler, Fairfax 4 Miler (I have soft PRs at these distances I hope to better). For 2019, I am lining up the Cherry Blossom 10 Miler and the big spring goal is, once again, London (absolutely beautiful course, would love to run this healthy). Beyond that, would love to add New York to the list in the fall and achieve my 3rd Abbott WMM star. To date, it’s a close call for me between my most recent races at Chicago and Richmond (with the edge going to Richmond). 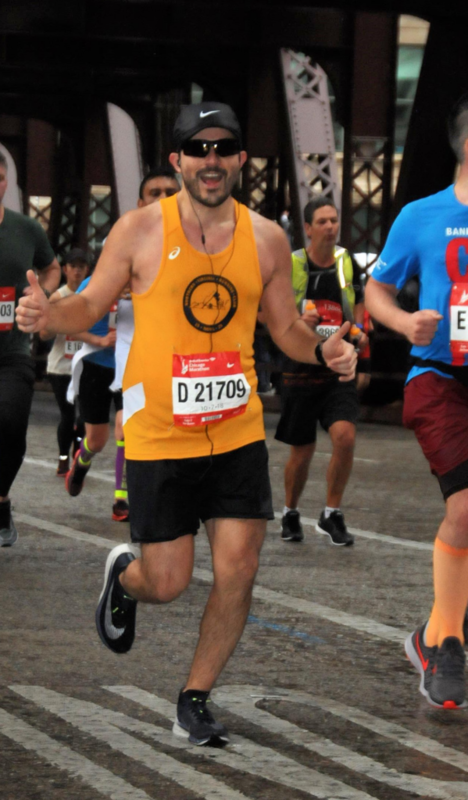 With my spring marathon goals derailed by injury I was left with shaken confidence and a sour taste in my mouth (in large part due to the pressure I put on myself). I promised myself to have fun with Chicago training and work on the mental side of running. I went in without any expectations and came out with a PR (feeling strong the whole way through)! As for Richmond, even though I had not committed to a full race effort I still felt a PR would be possible. While drifting off to sleep the night before the race I realized I forgot my watch at home. After the initial panic subsided, I embraced that I would be running “blindly” and said to myself (to quote Mo Farah), “Whatever will be, will be.” That morning, I tucked in with a pace group and ran with them for the first 11 miles before detaching and gunning for the PR. I don’t plan on running without my watch again, but it actually turned out to be freeing! 2 years ago, I googled running clubs in Northern Virginia and came across NOVA. While I was initially intimidated by how fast everyone is (and thoroughly humbled that first practice), I knew that training with likeminded individuals and having that kind of environment would inspire me to train harder and more seriously. I’m still not the fastest, but have improved considerably and know that the results are there as long as I put in the work. I’ve been running for 4 years and 2 years with NOVA, so my best running days are still ahead of me. As for my favorite parts of NOVA, I appreciate the encouragement from the team and the friendships I have formed. I also really like the gold singlet. 5) What’s the best piece of advice you’ve received from Coach Jerry, and/or another member of the NOVA club? Erin helped me realize that it’s about enjoying the process and focusing on the run at hand (foot? ); even beyond that, she helped me establish the foundation/discipline of much of my running to date, helping me see the importance of consistency in training. 6) What thoughts do you have on your performance at the Chicago Marathon and Richmond Half Marathon, or other recent races? I feel like these last two races helped me purge a lot of the pressure I put on myself in the lead up to London 2018 and made me realize the importance of mindset and patience. The results will come with consistency in training so just keep showing up; patience is key so that you don’t blow yourself up in training and lose sight of where you want to be. Also, mindset is a huge component of endurance and can make those tough miles a lot more bearable. If anything, both those races have affirmed these beliefs and that I am just getting started with my best results still to come. “Let Your Mind Run” by Deena Kastor.